FACT CHECK: Michigan Farmers Forced to Destroy Edible Cherries to Prop Up Imports? Michigan Farmers Forced to Destroy Edible Cherries to Prop Up Imports? 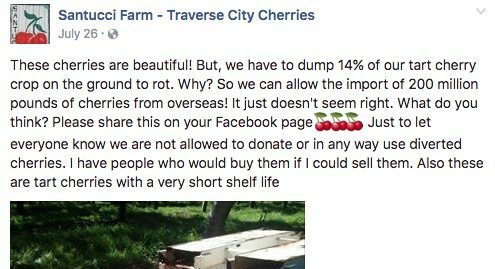 A viral Facebook post about surplus U.S. cherry crops destroyed to "make room for imports" appeals to locavores but contains some inaccuracies. A Michigan farmer was forced to destroy 40,000 edible cherries to make way for cherries imported from outside the U.S.
Michigan cherry farmer Marc Santucci destroyed 14 percent of his 2016 crop due to cherry industry limits on the supply of marketable cherries. Cherry farmers requested they be covered by a USDA marketing order (it was not imposed on them), the order was implemented to stabilize the volatile cherry market (not to "protect imports"), and farmers are not required to destroy surplus cherries. Santucci’s post slowly circulated on the social network, attracting the attention of blogs and health-conscious social media users through September 2016. As presented, Santucci’s tale sounded like an unbelievable level of bureaucratic interference with the farm industry and left readers wondering whether his report about having to destroy 40,000 pounds of edible cherries in order to “make room” for imported cherries (and was “not allowed to donate or in any way use diverted cherries”) was accurate. Online articles pinned blame for the cherry-chucking on the United States Department of Agriculture (USDA), citing a 29 July 2016 Detroit Free Press article about the social media controversy that referenced the federal Agricultural Agreement Act of 1937. The Detroit Free Press article only briefly mentioned the USDA as a starting point for a very complex cherry charter, noting that cherries were originally not regulated under the Agricultural Agreement Act, but the cherry industry opted into its provisions in 1995. At issue is a marketing order imposed through the U.S. Department of Agriculture as part of the federal Agricultural Agreement Act of 1937. But that law only applies to the tart cherry industry because growers and processors opted into the order in 1995. “It was created at the industry’s behest. It was voted in by growers and processors. It’s not an imposition from outside,” said Perry Hedin, executive director of the DeWitt-based Cherry Industry Administrative Board [CIAB], which oversees the marketing order not only in Michigan but in all states across the country that produce commercial crops of red tart cherries, including New York, Oregon, Pennsylvania, Utah, Washington and Wisconsin. Tart cherries are one of the most volatile crops grown in the U.S., with yields that can vary dramatically year to year, Hedin said. In a classic example of what happens on social media when people form opinions based on emotion instead of fact, a Northwestern Michigan tart cherry grower’s Facebook posting has gone viral, but with faulty information to back up the posting’s claims … The problem, however, said Kevin Robson, horticulture specialist with Michigan Farm Bureau, is that the information posted shows either shallow understanding of the federal marketing order or a deliberate attempt to change the order because of political disagreement. Administered by the Cherry Industry Administrative Board (CIAB), the order this year required tart cherry processors to keep 29 percent (the farmer’s posting said he was ordered to dump only 14 percent) of the crop they handle off traditional markets (pies, sweetened desserts, etc.) in an attempt to stabilize both prices and supply, which in cherries has been notoriously volatile. In response to prices that were below costs of production, tart cherry growers in seven states petitioned the USDA to put a new order and administrative board in place, and prices began to stabilize. Still, some growers, such as the one who posted the photo of a small pile of cherries, took exception to the order. Processors’ options in times of surplus include holding the restricted cherries in surplus — frozen, dried or concentrated — for a later slow year. Farmers also can attempt to sell the surplus cherries in overseas markets or sell them domestically in a newly created market, either as a new product or by convincing a supermarket chain or other end user currently supplied by imported cherries to switch to U.S.-grown, he said. Hedin said Santucci could have worked with the [Cherry Industry Administrative] board to find a place to donate the surplus cherries, which typically aren’t eaten raw like sweet cherries because of their very short shelf-life, but are instead used in products such as pie filling and jams. The Facebook posting wrongly puts the blame for cherry dumping on the marketing order, Robson said, when it is the processor who makes the decision to ask farmers to dump cherries. “I was just notified when we started shaking the trees that 14 percent would have to be kept off the market, so it didn’t give me time to find any alternative action,” he said, adding that tart cherries only have a two-day shelf life. It was true that Santucci’s 2016 crop was (as with that of all other cherry growers) subject to a growers’ agreement barring surplus cherries from the marketplace, and Santucci asserted he had insufficient time to properly divert his surplus cherries to other uses or markets. 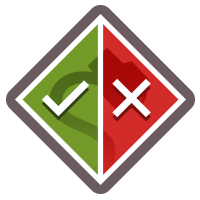 But the agreement under which the tart cherry market is regulated doesn’t mandate surplus cherries be destroyed, nor does the protocol exist to protect foreign imports. Cherry growers in several states voluntarily opted in to a USDA marketing agreement (rather than being forcibly regulated) following a period of instability in the cherry industry, and agriculture experts widely agree the provision provides more protection than harm to cherry growers. Michigan Farm News. 29 July 2016. Detroit Free Press. 29 July 2016.